In Friday’s challenge at UA, 88 teams made up of 350 sixth graders are expected to compete. 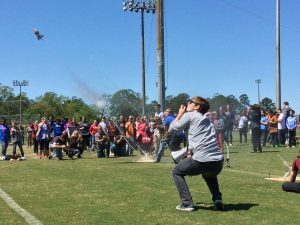 TUSCALOOSA, Ala. — Two University of Alabama student engineering groups are continuing to get children involved in the world of engineering with their annual rocketry challenge. 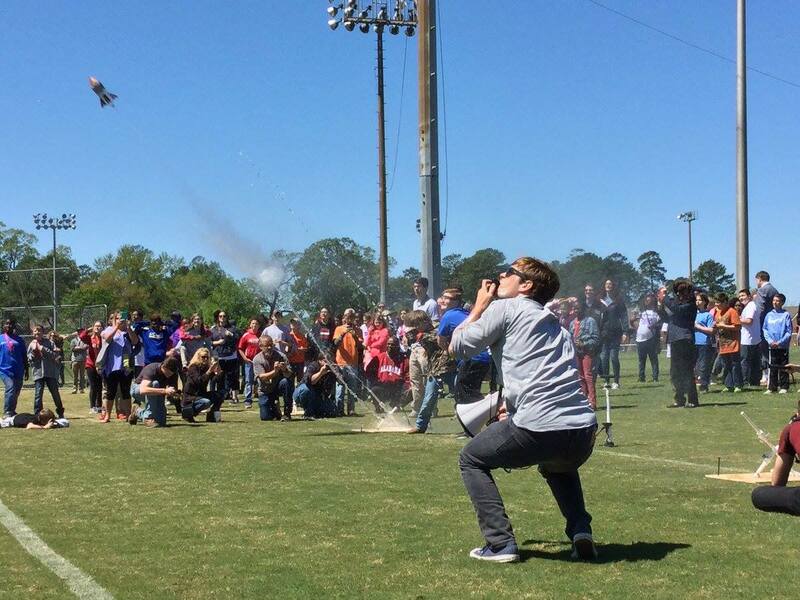 The Tuscaloosa Rocketry Challenge, organized by Alabama Rocketry Association and Alabama Students for the Exploration and Development of Space, will be held at noon Friday, April 6, on UA’s outdoor recreation fields. Water rockets are launched from an air-pressurized pad and shot across the field. Each rocket is judged by the distance traveled. In the challenge, 88 teams made up of 350 sixth grade students will compete. The students represent 11 middle schools in the Tuscaloosa County and City school systems. The top five schools and the top three teams will each be awarded trophies recognizing their achievements. Leading up to the event, UA College of Engineering and Honors College students in a service learning course visit each participating middle school and spend a total of four days teaching them the history of space exploration, a brief intro to physics, and how engineering relates to what they are learning in their middle school science classes. After teaching about the history of rockets, the UA students work with the sixth graders to create their own water rockets. Using two-liter bottles, duct tape and poster board, the middle-school students construct rockets that are propelled by water. About 1,750 sixth grade students in the county participate in this four-day learning experience and are able to compete for a spot in the final rocketry challenge. On the fourth day, each school hosts a preliminary rocket launch, which decides the top eight teams that will be invited to compete at UA during the Tuscaloosa Rocketry Challenge. The day of the challenge, the middle school students will tour the UA engineering facilities as well as the labs to show them projects the College students are working to complete. Over the past three years, the program and challenge have grown from one participating school to 11 schools from across the county. The Honors College course ensures the stability and growth of the program, and the student leaders hope to spread this idea to other university communities. Austin said it’s a learning experience being able to go out into the community and teach these kids something new and enjoyable. The middle schools participating in the challenge are Echols, Collins-Riverside, Westlawn, Sipsey Valley, Hillcrest, Duncanville, Rock Quarry, Brookwood, Tuscaloosa Magnet, Davis-Emerson and Northside.